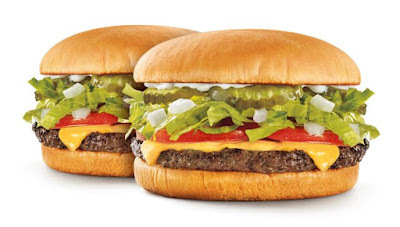 Sonic will be offering single patty cheeseburgers for half the regular menu price all day on Wednesday, April 10, 2019. The burgers feature a quarter-pound beef patty, American cheese, crinkle-cut pickles, chopped onions, shredded lettuce, and tomatoes, plus a choice of mustard, mayo, and/or ketchup. As usual, the deal is good at participating locations, while supplies last (it's a good idea to call ahead and check before making a trip). Sonic Cheeseburgers normally cost close to $4 (varying with location). If you really like the discount, Sonic has a long-running deal for half-price cheeseburgers on Tuesday nights, after 5 PM.